Life after summer fun requires some adjustments for kids and parents. If your family is like most, you will be dealing with cranky kids that don’t want summer break to end and organizational challenges surrounding schedules and stuff. Here are some tips on how to avoid the chaos and keep your sanity while going into the new school year. • Designate a home for everything. Every backpack, skirt, homework assignment must have its own place. Get the kids in the habit of placing everything where it belongs. • Place like with like. 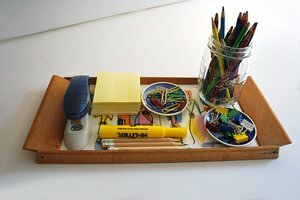 All pencils go in one bin; permission slips in one clear envelope; coats on the same row of hooks. • Something in; something out. When you buy something new, you get rid of something old. No exceptions! Here are more ways to escape back-to-school clutter from Lisa Gordon a contributor to House Logic. or call Susan Phelps for more info: 941-726-2227.